Window tinting is not just for cars! Apex professionals are commercial window tinting specialists, ready to help with your large or small business. We have years of experience, we know just the right choice of window film for your specific needs, and how to properly install it. Whether your biggest concern is glare, heat reduction, or security… Apex commercial window tinting is your answer. Windows are part of almost every building’s design, for looks, and to let in natural light. But building designers aren’t always thinking ahead to the environment they are creating inside, with unwanted heat and glare. The good news is that installing Apex business window tinting will keep it cooler, make it more comfortable and get rid of glare issues. Glare is a big problem because it makes registers and computer screens hard to see. When this happens, eyes get strained and lack of good visibility means more mistakes happen too. Many times a business will put in blinds to address these issues, but they do not have the same advantages of business window tinting. Apex window film actually blocks the heat before it gets inside, unlike blinds which let the heat into the building. And window tinting film won’t block the view! Not to mention they aren’t as difficult to clean as blinds are! We think it’s clear that window tinting film has many advantages over blinds for the business windows of Paso Robles! Windows are a natural entry point for would be thieves. While nothing can stop a determined thief, Security Film window tinting can actually deter intruders and slow down their access into the building. Thieves don’t like to enter through a window they don’t know what might be waiting for them inside, and if they do try to break in anyway, it is much harder to shatter glass with security film on it, and getting through it will take more time. Every second counts to give help a chance to arrive! Apex has a wide selection of safety and security window films. They range from 4 mil through 18 mil. Apex installs anchoring systems to strengthen and bind the security films also. Have trouble with taggers?… we also have Graffiti Guard window films. Like Security Film, Graffiti Guard is thick. It is applied to window exteriors. When a window gets defaced or tagged, the window tinting film can be replaced. This is typically easier and less expensive than resurfacing or having to install a whole new window. Most Paso Robles storefronts have large glass windows to allow shoppers a view inside and to let natural light in. 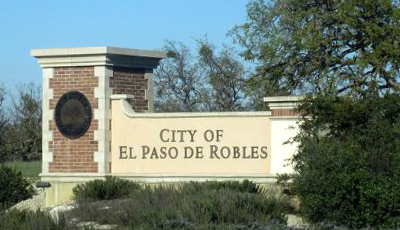 Paso residents and business owners know too well how much unwanted heat this let’s in though! And beside the heat, UV rays get in as well, damaging merchandise, carpets, wood flooring, and more. Heat and sun damage aren’t the only problems either – Glare is a big concern. Not only does it make the environment uncomfortable, but glare can add to costly mistakes, if your employees can’t see their computer or register screens they are much more likely to make errors. Eye strain is also a glare byproduct. Business window tinting glass film installed by Apex will help with unwanted glare and decrease the amount of solar heat that gets inside (up to 70%!) Commercial window tinting for your business will save you money on your electricity, and prolong the life of your A/C unit, saving on replacement costs too. Commercial window tinting is great for all stores and small offices and businesses, but it has even more advantages for schools, legal offices, doctor offices and medical centers, etc. They too, benefit from the added comfort and energy savings, but the bigger concerns of privacy and security are addressed with the proper window tinting film installation. Sensitive documents, confidential materials, students and patients rights and privacy. All reasons views inside should be limited, but without limiting the views to the outside. Apex has a great assortment of one-way, frost, opaque, and decorative window film options. An Apex professional will help you determine the best choice for each location’s needs. 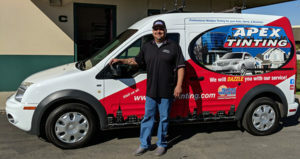 Paso Robles, you can also get Residential Window Tinting for your home!